In and around Hechingen there is much to see and experience. In the town below the impressive fortress Hohenzollern you will see many interesting ecclasiastic and profane buildings. Also the hinterland is worth a trip. The Alb foothills are a paradise for hikers and walkers with splendid views and numerous botanical and historical gems. A wine cellar with amphores, remain of an underfloor heating in the old bath house and the small, partly reconstructed templets for the gods Jupiter, Juno and Minerva - the open-air museum Villa Rustica at Stein, a part of Hechingen, illustrates the life, work and religious beliefs of the population in the Roman province Upper Germania. The Old Castle, built as an administrative building within the Renaissance castle, has accommodated through the centuries for example the Princly Chancellery and the Princely Grammar-School. Today it houses the Municipal Museum. The exhibits from all parts of Hohenzollern focus on archeological findings from early and primitive history, Christian sculptures and paintings from the 14th to 18th century, the history of guilds, philistine and noble culture in the 18th and 19th century as well as paintings and drawings with Hohenzollern motives. 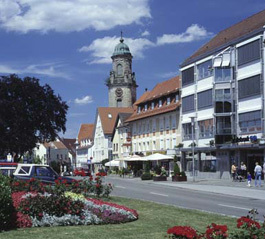 The Convent Church is the landmark and the heart of Hechingen. The church, built between 1780 and1783, is exemplar for classicistic architecture. The small castle, in 1786 intended as a summer residence, was situated outside the town in the Prince’s Garden and consisted only of the central building with the oval garden hall. In the years of 1833/34 the two lateral wings were added to build a residence for the hereditary prince, the later prince, and his wife. Since it was a fairly modest building for a prince, it was not referred to as castle, but as villa. The Conventual Church St. Luzen is an art-historical gem of supraregional significance. It is one of the rare examples of the transitional period between late renaissance and early baroque in Southern Germany. The Zollernalb with its scenic beauty is most rewarding for lovers of nature and hikers: pristine Alb scenery, picturesque municipalities, expansive juniper heathers and mighty beech forests. The clearly sign-posted rambling routes lead you through the lovely Alb foothills and up to the rugged beauty of the Alb plateau.